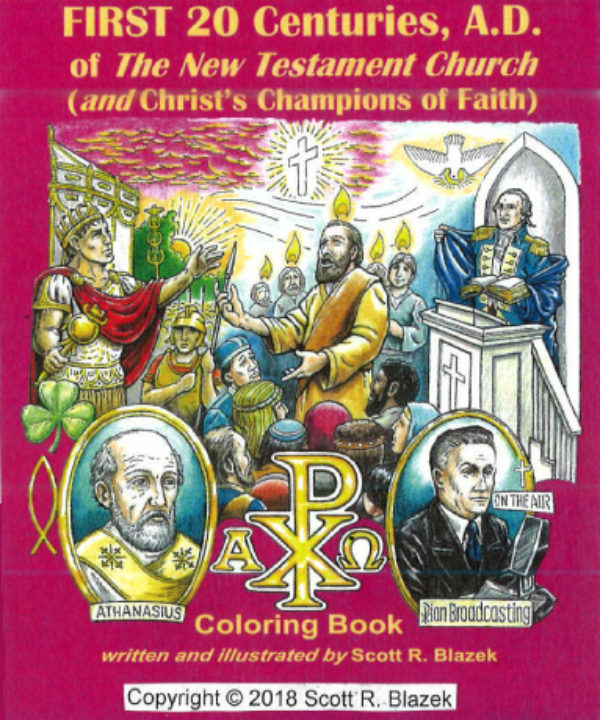 Here is the follow-up to “The 500 Reformation Anniversary Coloring Book”, the companion survey, “FIRST 20 Centuries, A.D. of the New Testamant Christian Church (and Christ’s Champions of Faith), Coloring Book.” What a special opportunity to introduce adults, youth, senior citizens or yourself to the history of the Christian Church! This 38 page 8 1/2 x 11″ booklet takes each century, often in one page, sometimes two or more, highlighting those special people and events, through whom God has passed down to us the saving Gospel of our Lord and Savior, Jesus Christ. Some ideas/uses for this volume include parochial classrooms, Sunday School, home schooling, adult Bible class, youth groups, give-aways to visiting families, and so much more. If you’ve already reviewed “The 500 Reformation” coloring book, this is a great follow-up. If you haven’t done the Reformation survey, consider “The 500th Reformation C. B.” for the 15 weeks in the Fall season, followed by “1st 20 Centuries C. B.” for a Bible study starting Jan. This telling of the N.T. Church includes villians (and heresies); liturgical developements (including early hymns); the influence of Christianity (on art, literature, world affairs); a one page timeline; and more. Order a copy to review for a class or just for your own personal edification (just $5.00 ea. plus s/h). See the accompanying order form. If you wish to call your order in (575-769-0693), the exact shipping cost (media mail or U.S. Priority – your choice) will be added to the invoice. Most orders can be shipped within a week of receiving your order, but act now while initial stock last. Feel free to share this with others who appreciate the history of Christ’s Bride – the N.T. Church! Click the picture to order and learn more! 500th Anniversary of the Reformation Coloring Book Now Available! Copyright © 2016 Scott R. Blazek. All rights reserved.